For Jason Eric Kessler, the fall came swiftly and proved to be severe. A year after organizing “Unite the Right” and drawing some of the biggest names in the racist world — white nationalist Richard Spencer, former Ku Klux Klan leader David Duke, a grandfather figure to the racist movement, the League of the South and its neo-Confederate warriors — to his hometown of Charlottesville, Kessler finds himself adrift from the movement. Kessler, who is at the center of two federal lawsuits, is also a pariah in the city of 48,000, known best as the home of Thomas Jefferson and the University of Virginia. Now, as Kessler tries to organize one and possibly two anniversary rallies for August 11 and August 12, he has few friends among the high-profile racist "alt-right," virtually no support among the locals in Charlottesville, and a spate of legal problems stemming from the violent and deadly 2017 rally. Christopher Cantwell, a podcaster known as the "Crying Nazi," has been critical of "Unite the Right" organizer Jason Kessler since the racist, alt-right rally in August 2017 turned into a riot in Charlottesville, Virginia. Cantwell took part in the rally and was later arrested. 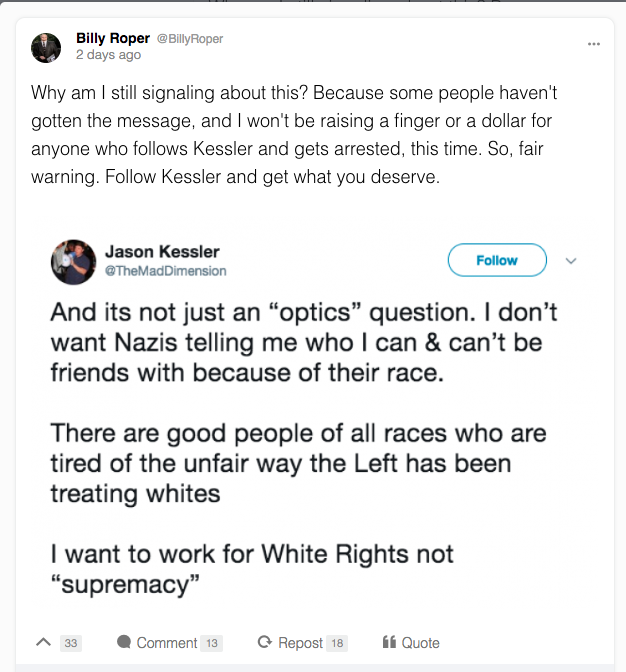 And the split has left Kessler publicly distancing himself from a group that, just a bit more than a year ago, he latched on to quickly while searching for an identity and allies among the far-right. But, before diving into his own brand of “identity politics,” Kessler, a 2009 University of Virginia graduate, was a one-time fiction writer and poet who held a series of jobs, including dishwasher, gym technician, truck driver and handyman. According to his resume, Kessler has been employed a total of just over 10 months in the last seven years. Writing life, it seems, wasn’t for Kessler. Instead, he stepped deep into politics in 2016 when he took on a black city councilman, Wes Bellamy, over racist and homophobic tweets sent before Bellamy’s political life. That crusade, which failed to recall Bellamy, put Kessler on the local media map, but also drew the attention of conservative outlets such as the right-wing website the Daily Caller. In a deposition related to his lawsuit against the city of Charlottesville, Kessler described how he made $240 for several articles he sold to the Daily Caller and another $600 from VDare, an anti-immigration website popular with the alt-right. After getting a taste of politics and notoriety, Kessler took on the idea of the “Unite the Right” rally. The basic plan was to gather as many alt-right, racist, neo-Nazi and far-right figures as possible in Charlottesville to make a solidarity-like stand in the wake of President Donald Trump’s election, yet under the pretext of safeguarding Confederate monuments. Richard Spencer had already become the golden boy of the alt-right, making speeches on college campuses and holding his infamous gathering at the Ronald Reagan Building in Washington, D.C., for the annual conference of the National Policy Institute on November 21, 2016, just weeks after Trump’s election. During that gathering, participants shouted “Hail Trump!” while raising their right arms in a Nazi-style salute. So, Kessler, who has a record of arrests on charges ranging from assault to perjury, began inviting people and groups to Charlottesville. The rally came with great fanfare among the alt-right and racist communities. “This is the biggest rally event we’ve had this millennium,” Brad Griffin of the neo-Confederate League of the South said on a 2017 radio show hosted by David Duke. “Unite the Right” drew from across the far-right spectrum: The neo-Nazi National Socialist Movement, the neo-Confederate League of the South and its Confederate flag-toting warriors as well as Klansmen and a variety of militia groups. Instead of unification, Unite the Right devolved into a riot, with Kessler’s invitees brawling with counter-protesters. One person, 32-year-old Heather Heyer, died after a car plowed into a crowd, killing her. A neo-Nazi sympathizer, James Alex Fields, was charged in her death. Two Virginia State Police officers also died when their helicopter, used to monitor the event, crashed. None of Kessler’s actions have made him popular in his hometown. Some in Charlottesville call him “murderer” when he’s seen in public while some business owners make it clear that Kessler is unwelcome in their stores. “We all know who he is,” said Phyllis Hunter, who owns the Spice Diva Emporium near downtown Charlottesville. “Jason Kessler is a massive footgun for the white nationalist movement and people are going to end up in jail for this,” said former Charlottesville resident Emily Gorcenski, who has done verbal combat on Twitter with alt-right figures. Former Charlottesville resident Emily Gorcenski has done verbal combat with the alt-right in person, in interviews and on Twitter. In one tweet, she refers to Kessler as a "foot gun" - a weapon that can be used to shoot yourself in the foot. The University of Virginia Law School also moved to keep Kessler from using its library in April. That came after Kessler was met with protests as he tried to enter the facility. Since then, the university issued a trespass warning to Kessler, keeping him off the school’s grounds for four years. “The warning was issued due to multiple reports from students that Mr. Kessler threatened them, targeted them through cyber-bullying and cyber-harassment, and targeted them based on protected characteristics,” the university said in a statement in April. His attorney, James Kolenich of Cincinnati, said Kessler is a true believer in his actions. While after-action reports found police and law enforcement made mistakes, Kessler denies any responsibility for the injuries and damage caused during “Unite the Right.” Instead, he took to passing the blame to others who he invited to take part in the rally. “Nothing that’s happened is your fault?” John Longstreth, a Washington, D.C.-based lawyer representing the city, asked. “Okay. I’m sorry, do you believe that anything that has happened in the city is your fault?” Longstreth asked again. “And you were able to — and you weren’t able to keep him from taking over the rally, I guess, is your testimony?” Longstreth asked. “I didn’t know it was happening,” Kessler replied. Kolenich, a self-described “antisemite,” said part of the problem is the way his client views the world. 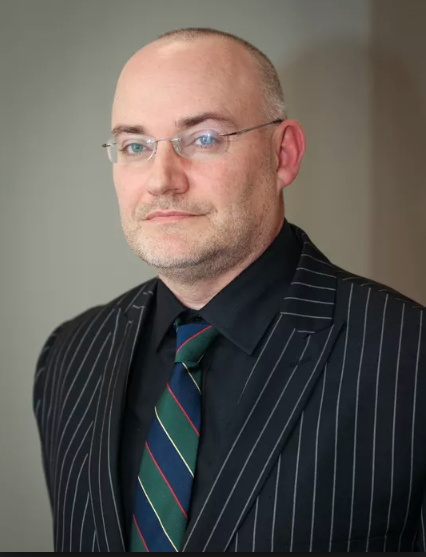 James Kolenich of Cincinnati represented Jason Kessler in his lawsuit against the city of Charlottesville. Kolenich said Kessler believes in the causes that prompted him to hold "Unite the Right" in August 2017. Kolenich said Kessler “feels really bad” about how Unite the Right went in August 2017. It’s not a sentiment Kessler himself expressed after the rally. Kessler even went so far as to mock Heyer. Just days after the rally, Kessler took to Twitter to slam and insult Heyer, but later blamed the message on a combination of Ambien and Xanax. Along with the bad publicity the violence brought to the alt-right movement, Kessler’s tweet caused several major alt-right figures to walk away from him. Spencer associate Mosley also walked away from Kessler, but six months later patched things up during a podcast. In the June deposition, Longstreth asked Kessler about his relationship with Mosley. “Has he in any way severed ties with you or disassociated himself from you?” Longstreth asked. “Right. Yeah, we don’t correspond,” Kessler said. Arkansas-based neo-Nazi Billy Roper posted to alt-right social media site Gab that, unlike after “Unite the Right,” he won’t be aiding anyone who attends another Kessler-organized rally. Arkansas-based neo-Nazi Billy Roper called on other racists to avoid dealing with Jason Kessler as he tried to organize a "Unite the Right 2" rally. Multiple former Kessler allies walked way from the Charlottesville, Virginia, native after the first "Unite the Right" rally devolved into violence and resulted in three deaths in August 2017. Spencer has already announced he would not return to Charlottesville for an anniversary rally. And, other groups have reached legal agreements with the city not to hold armed, organized protests in the city again. League of the South founder Michael Hill said his group will not return, leaving Kessler without a major component of his initial rally should he decide to hold a second protest in his hometown without a permit to do so. “We don’t have anything to gain by going back to Charlottesville,” Hill said. Kessler isn’t trying to get his former allies to embrace him. Now, Kessler is planning an anniversary rally in Washington, D.C., on August 12, but has admitted he has no idea who will be there or how many people to expect. So, what does the future hold for the once-rising star of the alt-right? “I’ve told him he can’t maintain his presence in Charlottesville while playing footsie with real neo-Nazis,” Kolenich said. But Kessler, much like the groups he unleashed on his hometown, shows no signs of leaving, despite his fallen status in the racist movement. And, it appears that’s something Charlottesville residents and officials will have to adjust to.